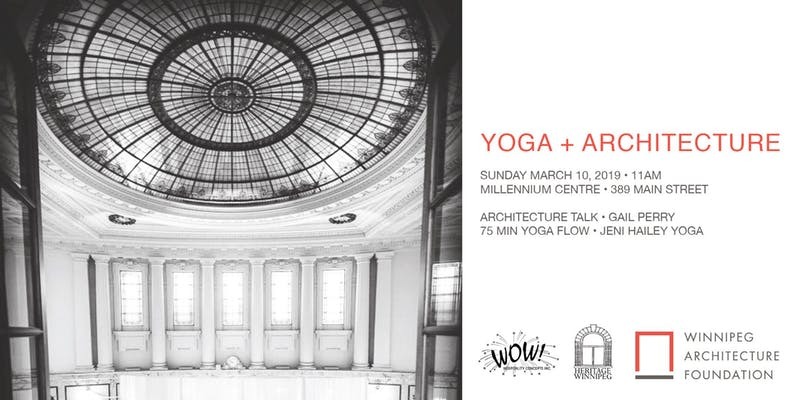 Join the Winnipeg Architecture Foundation for Yoga and Architecture inside the beautiful Millennium Centre at 389 Main Street. Learn about the design of this iconic Winnipeg building and enjoy an all levels vinyasa flow class beneath its exquisite glass dome. All proceeds from this event go towards the Winnipeg Architecture Foundation. Please arrive at least 15 minutes prior to the start of the event. Bring your own yoga mat and water bottle. Capacity limited, register via EventBrite to ensure a spot in class. Event Presented by the Winnipeg Architecture Foundation. Event supported by WOW Hospitality and Heritage Winnipeg.